the grey one. I'm releasing this white one first and the other 2 patterns will follow asap. There is a print friendly button at the bottom of this pattern. If you would like to leave a donation please do so by using the donation button also located at the bottom of this pattern. 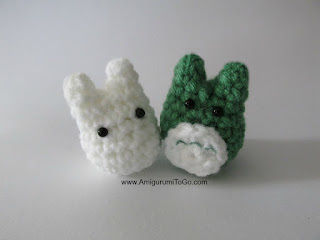 Donations of any size are greatly appreciated and do help me to keep on providing free patterns! Thank you so much and enjoy! Read me ~> Add in a marker at the end of row 2 and move that marker at the end of every row. I just use a short length of yarn and pull it through the last stitch I put in at the end of every row. Work in continuous rounds, do not join. Have any questions or if you come across a mistake in the pattern please leave a message in the comment section below. 4.5mm eyes with fabric fusion or tacky glue to install them. Or instead of safety eyes you can use paint or sewing thread. sl st across into the 6th st from the hook. This has created 2 sections. Continue around in the right section with 1sc in next 6st for 2 rows (skip over the sl st). f/o then weave in and out of every 2nd FLO and pull tight to close. 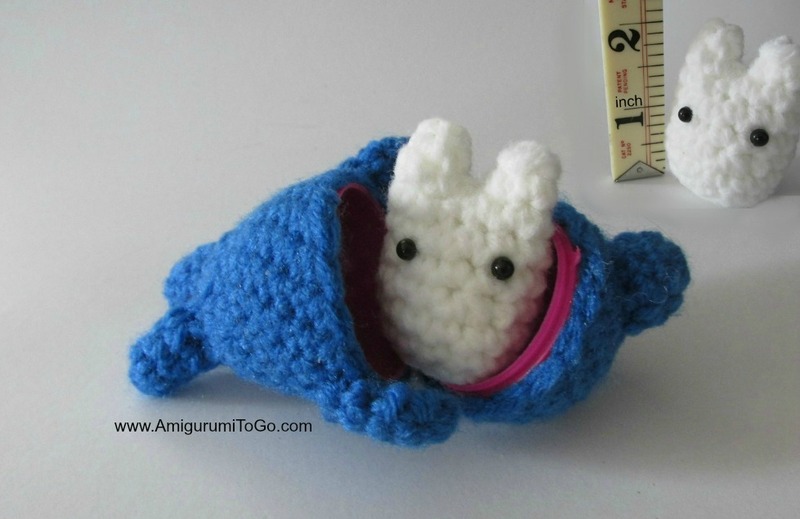 Gently carry the yarn tail into the body to hide it. Reshape the ear a bit by pulling on the tip to get it back into shape if it got pulled down. Insert yarn into the corner then put 1sc in the next 5st. 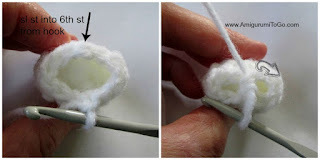 Next, pull back the 1st ear so it's out of the way and put in 1sc into the corner of the 1st ear right in front of where you inserted the yarn to start the 2nd ear. You now have 6st in the first row. Now put 1sc in each of those 6st for 1 row. Finish off the ear just as you did for the first ear. insert white yarn in between the 2nd and 3rd row near the middle of the doll. Ch1 then put 3hdc into the next hole over from where you inserted the yarn. f/o leaving a bit of a tail for sewing. The one side of the hdc's will be like a flap, sew that open edge down to the body, knot off and hide yarn tails in the body. 1) You can use 4.5mm safety eyes. I placed mine in between the 7th and 8th row. I did not use the backs as I found it easier to glue them in. I buy these tiny eyes online. See the 2nd question here on my FAQ page for the link. 2) Sew in eyes with black sewing thread. 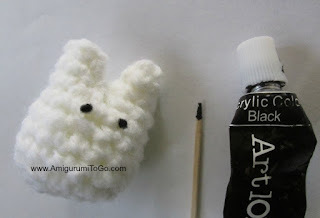 3) Use a toothpick and dot in the eyes with black acrylic paint. If you do paint them on then you must let the paint completely dry before moving the doll around. You don't want to stain other parts of your doll. I made the tiny green one to get clearer photos of the ears so I decided to just finish it and then made him a tummy too! Start with a loop with 6st then 2sc in each st (12) I drew the green parts on with a fabric pen.